Latex hybrid mattresses offer a unique sleeping experience compared to the typical hybrid beds that use memory foam layers. They offer more comfort through bounce and cushioned support, while providing an improved cooler sleeping surface. Latex mattress once yearned as a luxury choice have become much more affordable in the past few years. Hybrid mattresses have also learned to combine latex with spring coils for a buoyant and consistent sleep surface. 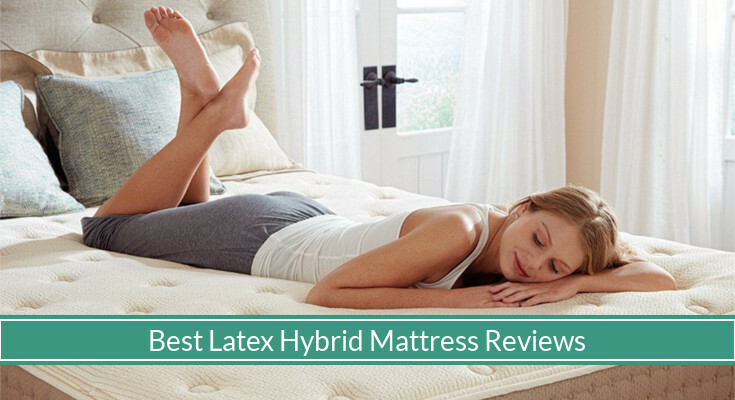 In this buyer’s guide, we look at how latex hybrid is different from the usual hybrid mattresses and look deeper into the best top 5 hybrid latex mattress reviews available for a good night’s rest. 1 How is Latex Hybrid Different From Other Hybrid Mattresses? How is Latex Hybrid Different From Other Hybrid Mattresses? Latex hybrid mattresses differ by bringing the unique properties of latex foam to your bed. Memory foam is notorious for trapping heat and providing a sleeping surface that sinks uncomfortably. As we have learned in the difference between our latex and memory foam guide, latex brings a bouncier and improved cooler sleep. memory foam and innerspring – most popular on the market! The memory foam and innerspring combination is the most popular and well-known hybrid mattress mix. However, for those who enjoy the feel and comfort of latex, in this buyer’s guide we cover hybrids that use latex. A wide variety of design and construction is available, with different comfort levels to choose from. Latex hybrids are great for those in search of a slightly softer alternative, with better bounce and cooler sleep. They are especially a good choice for side sleepers, back sleepers, and heavier individuals. The Eco Terra is one of the best hybrid latex mattress on the market, as a luxury all-natural latex and pocketed coil mattress. 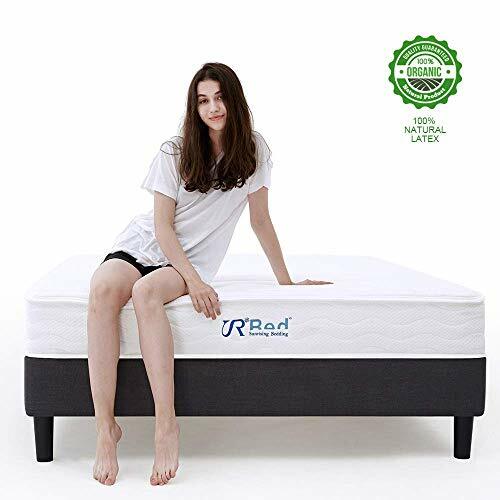 The mattress comes with 100% latex built for a comfortable buoyant and responsive support, with an even more supportive fabric-encased coils offering minimal motion transfer bounce. It is hypoallergenic and contain no harsh dyes or chemicals that can cause irritation. The mattress most notable appearance is its attractive pink pinstripe organic cotton fabric that is breathable and elastic. The Eco Terra Mattress also works well with any adjustable bed base. Firmness and feel: 5.5 out of 10 for the medium comfort, 6.5 for the medium-firm comfort. The mattress feels great. It’s not too springy and not too squishy or have a sinking feeling like most memory foam type mattresses. The medium-firm can be a little uncomfortable for side sleepers, so it’s more suitable for back sleepers but the medium comfort can be just right. Unlike memory foams that need to be broken in and then become softer, the Eco Terra latex more or less maintain its shape and consistency pretty well. It’s a little more softer in feel, but not too soft or too firm. It’s a great mattress for older folks, heavier individuals, those with bad backs, or are a back sleeper and side sleeper. The edges are also very supportive when sitting on the side, and as we find out later, it’s because of the steel coils being 1 gauge up for a stronger resistance. Construction: The mattress layers is made with two simple layers: a tatalay construct latex foam and 16-gauge steel. The mattress edge support consist of 15-gauge outer perimeter coils for added firmness so you can make use of the full surface of the mattress. As we have dug deeper into the difference between tatalay and dunlop guide, tatalay as the newer construct of latex foam offer a softer and more luxurious feel, with more bounciness and springiness to the mattress. There is also better airflow with tatalay compared to dunlop, leading to a better regulated sleeping temperature with less heat getting trapped within the mattress. 16-gauge steel is also on the softer spectrum of most soft innerspring coils, as most typically use 15-gauge for a medium-firm feel. Sleepy Trial: 90 nights. The Eco Terra Mattress comes with a 90-night trial period when ordered directly, with a minimum of 30 days before you can return for free. It can take some time before your body adjust to the bed and the mattress to soften up, which is why Eco Terra’s return policy requires a minimum of 30 days for a full refund free return. You can also order through Amazon in which case a 30-day return policy is available. Thickness: 10-inch (firm), 11-inch (medium), 12-inch (plush). The Viola Mattress most interesting features are its five-zone support and cool sleeping design. The mattress is covered th a highly breathable mesh-like fabric, combined with cooling gel infused memory foam and tatalay latex for a bouncy, comforting sleeping surface. It’s zoned support provide five areas of the mattress unique comfort levels and buoyancy, including a more supportive edge for full use of the Viola Mattress sleeping surface. firm: 8 out of 10.
medium: 6.5 out of 10. The great thing about the Viola is how they offer multiple comfort levels. For most people, you can go with firm or medium without a problem. 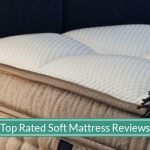 Those interested in a softer mattress compared to more popular mattress brands on the market will want to choose plush. The mattress sleeps comfortable and cool at night. You won’t get a smothered feeling with the mattress as your body rests on top. It has great support and with the right amount of softness sinking into the bed. It also does a great job absorbing motion so you cannot feel your partner moving around too much at night. Construction: The Viola comes with a very complex 12-layer build that aims to provide a very unique sleeping surface feel. Inside the mattress, we find the aerated (air holes) tatalay latex layer underneath memory foam to provide a bouncy, cushioned support of the sleeping surface. The memory foams are each infused with cooling gel for a better regulated sleeping temperature. To give the mattress its shape and deep compression support, individually wrapped pocket coils have different gauge levels to provide a more body-centric design. The center of the mattress has much firmer coils to provide spinal alignment and back support, while the upper body and hips are given softer coil to alleviate pressure. We also find the edges with firm coils to prevent any rolling off the bed. The entire mattress is encased in a high-end mesh fabric that is thin and provide better cooling compared to the covers of typical low-end mattress. The Lucid Latex and Gel Memory Foam Mattress is a mega big bed in its own right. 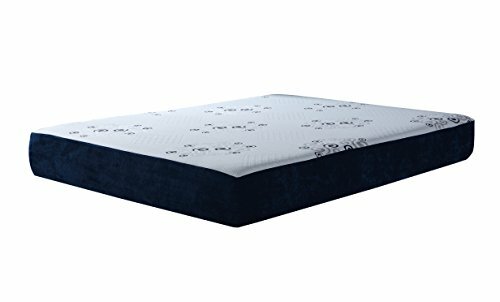 The latex in this hybrid is underneath 4 inches of memory foam, providing an excellent buoyant base for the pressure relief memory foam layers. Most notable is its 16-inch thickness, the mattress is made with several layers to create an optimal sleeping surface. The mattress is designed to be a medium-firm feel, with multiple upper layers that create a soft cushioned comfort, and a high-density bed base to provide deep compression support. There is a smell at first, so the mattress must air out for a few days. Leave your windows open, use a freshly washed mattress protector, and having a fan turned on can help. Firmness and feel: 6 out of 10. The mattress does get softer over time. However, it might be too firm for some slimmer sleepers. Heavier individuals and side sleepers will enjoy this bed. It is definitely cooler than most memory foam, but not as cool as spring mattresses. Edge support is great, which means no rolling off the bed or anything. The surface does give off a cradling feeling, with your weight evenly distributed. 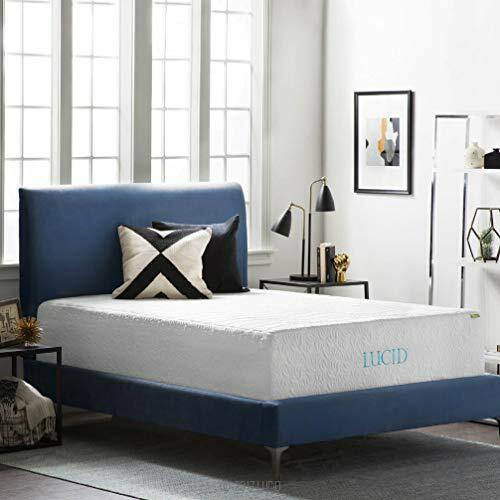 Construction: The Lucid Mattress is also wrapped with a quality brand Tencel blend cover, a well-known fabric that provide a highly breathable and moisture wicking sleeping surface for cooler sleep. The mattress is made with four layers: 1-inch bamboo charcoal memory foam, 3-inch ventilated gel memory foam, 2-inch natural latex, and 10-inch of high-density base foam. Bamboo provide a pleasant, plant fabric that is highly breathable With charcoal, the top layer can help reduce odor and provide a fresh-feel sleeping surface. Underneath, we find a cooling layer of an aerated gel-infused memory foam for cushion and for a better regulated sleeping surface. The latex gives all the top layers a supportive buoyancy while minimizing the amount of sinking. As a base, we find a high-density foam that gives the mattress its shape and thickness for a comfortable experience getting on and off the bed. Shipping: Free. It should be noted the Lucid Mattress is considerably heavier than other mattresses, so you should be prepared for a two-person job to move it into the bedroom. Sleepy Trial: 30 days. The mattress with a 30-day Amazon-backed return policy. The Sunrising Bedding Latex Hybrid is a great innerspring-centric mattress with a thin layer of 100% natural latex to provide cushioned support over an independently encased coils as a base. If you enjoy more emphasis on innerspring with its localized bounce with minimal motion transfer, this mattress is for you. The latex does a great job as a consistent cushioned layer for sleep. This bed can be great for those with back pain or shoulder pain. Firmness and feel: 7.5 out of 10. The mattress feels very firm, but comfortable. If you are looking for a firm mattress, this bed would be up there as well. The top is soft and springy, but there is not a significant amount of give. This makes the mattress suitable for sleeping on your back or stomach. We are a fan of the luxury cashmere wool cover, which provide a soft touch sensation. Although it’s nice to have a cashmere top, we still recommend using a mattress bed sheet or protector to keep the bed fresh and for long-lasting use. If you find the mattress to be too firm, a lot of reviewers have suggested the idea of buying a mattress topper. Construction: The latex is built with a tatalay construct, providing a buoyant sleeping surface that is slightly softer than its dunlop latex counterpart. The independently encased springs are made with tempered steel coils that provide pressure relief while giving the mattress its shape and base support. The mattress is also made in a way that can be slept on both sides. However, one side is the latex topping and built for sleep while the other side is meant for placing on a foundation or bed base. Sleepy Trial: 120 days. The mattress comes with a 120-day trial for a sufficient amount of time to test and break in the mattress. The Swiss Ortho Sleep Mattress is an very firm, high-density foam-based mattress. Built with an elegant bamboo fabric floral pattern cover, this reversible mattress combine memory foam with latex and regular foam to create a new level of firm and supportive sleep. If you need the most firm latex hybrid mattresses with less disruptive bounce, the Swiss Ortho Sleep Mattress is great for you. Firmness and feel: 8 out of 10. The mattress is one of the firmest comfort levels you can find. For those who need the firmness, with severe aches and pain due to softer mattress, the Swiss Ortho Sleep Mattress does its job. It takes some getting used to, and is nice for flipping. There is a little bounce on one of its side. The mattress also doesn’t sink deeply which is great for those who have experienced a trapping sensation with their beds. The sleeping surface is somewhat conforming, but definitely not as much as more popular mattress models. Construction: The mattress is designed with three layers of foam. The top layer is latex, memory foam is in its center, and regular foam as a base. 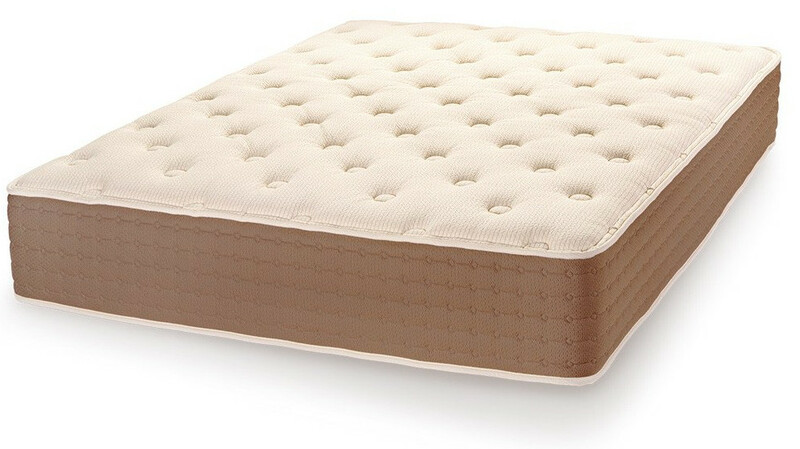 With a 4-inch latex top, the mattress sleeping surface is given a generous bouncing sensation. It provides a consistent cushioned surface without any trapped sinking feeling that can be common with memory foam. The memory foam center provide an interesting support, allowing the sleeper to sink a little thanks to the indirect influence without too much give. With a base foam, the mattress is given its shape and we find deep compression support especially for heavier individuals. All three layers are designed to be high-density to prevent the common sink that more popular brand mattresses have. The mattress is wrapped in a soft-knit, removable white bamboo cover. Bamboo is highly breathable and help wick away moisture for cooler sleep. Sleepy Trial: 30 days (backed by Amazon).